See what happens when you make snowmen indoors? They melt! Well, that was the look I was going for, anyway. I got inspired to make these insanely creative cupcakes after seeing them on Nicisme's blog (check out here blog; it's wonderful!). 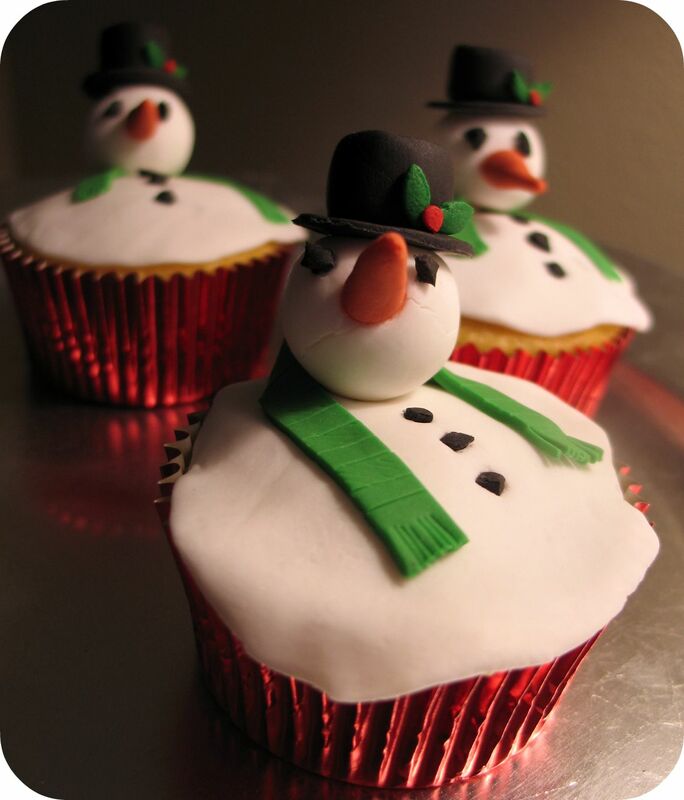 Although I found her cupcakes really charming, I decided to add my own personal touch by topping each snowman with a fancy top hat (adorned with holly) and a green scarf. You can't really see it in the photos, but each scarf had a unique pattern. I also strayed from her recipe in that I used fondant to make almost everything, except the holly. For that, I used holiday light bulb sprinkles but if I had planned ahead, I would have used holly berry and leaf quins instead. For the cupcake part, I made a simple orange and cranberry cake. I wanted something festive but not chocolate although the contrast between the melted snow and a chocolate base may have looked better. Oh well, these looked good and tasted yummy. The best part about the cake recipe was that it uses a cake mix. This comes in really handy when you're busy making bunches of other yummy stuff at the same time. Preheat oven to 350F. Line a muffin pan with cupcake liners and set aside. Put all the ingredients, except the cranberries, into a mixer and blend on low for about a minute. Scrape down the bowl, increase the speed to medium, and continue mixing for another 2 minutes. The batter should look nice and thick and be a pretty pale orange. Add the cranberries and mix a few more times on low, just until they are combined. Fill the cupcake liners about 3/4 of the way tall, being sure to mix the batter after each scoop (the cranberries like to sink to the bottom). Bake for 17 minutes (or until centers spring back when you touch them). Let them cook on a wire rack for 10 minutes before removing them from the pan. They need to be totally cool before decorating. Be sure to give yourself a few days to make the majority of the snowman parts. The heads, hats, holly and holly berries, coal, and noses must be made at least 3 days ahead to ensure they have enough time to harden. 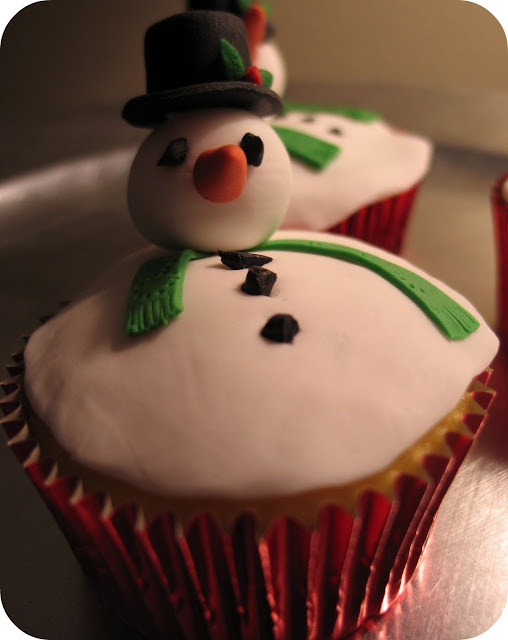 The melted snow and scarf must be made the same day to decorate the cupcakes. Each head was between 9 and 11 grams of white fondant. Form into a ball, and slightly flatten the top and bottom of each ball. Place on parchment paper to dry. 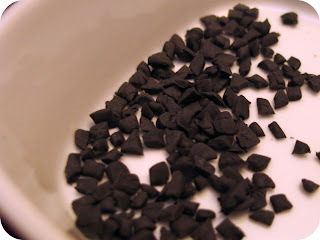 Make a thick (1/4 inch or so) log of black fondant. Use an exact-o knife to cut into 1/2 inch segments. Form each segment into a rounded, flat-ended cylinder. Place on parchment paper, flat side-up to dry. Roll out black fondant and cut using a large metal frosting tip. While the fondant is still mailable, stick the top of the hat to the center of the disk. You may want to use a q-tip to very gently moisten the bottom of the hat (be sure to pat on a paper towel to remove any excess water). Place on parchment paper to dry. Roll out black fondant and using an exact-0 knife, cut the fondant into lots of very small random "coal" shapes - I made about 100 or so. Be sure to separate them and place onto parchment paper to dry. Try to keep them all about the same size. Color a small ball (15 or so grams?) of fondant orange. Break really small fragments of the ball off and shape into a cone shape. You don't want them to look too perfect, after all they are supposed to be carrots. Flatten the end really well and let dry on parchment paper. Make these a least a full day ahead so they can have enough time to dry. Using a q-tip, gently moisten the bottom of a top hat, being sure to remove any excess with a paper towel. Place on top of the head. Let sit for at least 20 minutes or until dry. To assemble the face, start with the nose. Take each carrot and glue to the front of the head. I was able to cut off a tiny layer of the fondant from the flat end of the carrot and use that to stick it to the ball but if yours are too hard, use a brand new nail file to file down the surface; you want to try to get it as flush against the head as you can. Use sugar glue* stick to the head. If you don't have sugar glue, dampen with water but be really careful not to get it too wet. You just want it sticky. Don't push too hard into the head because if it's not all the way dry, it may crack the surface. Let the nose dry (nose side up) before moving on to the eyes. Use tweezers to place each eye on the head. Use sugar glue or water to stick to the head. Let dry, nose side up. Measure 9-11 grams of fondant and roll into a ball. Create a template but tracing a circle that's the same size as the top of your cupcakes and turn it upside-down, place fondant on top and then top the fondant with a piece of plastic wrap. 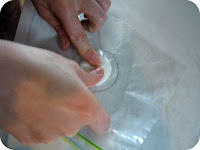 Using the heel of your hand and fingers, push and squish the fondant so that it flattens past the circle. Try not to get the fondant a perfect circle shape and keep any bumps and lumps in the surface. Remember, this is suppose to look like melted snow! You don't want it to look too perfect. Place each disk directly on top of the cupcakes. Try to put it on a little askew so that it looks like the snow is dripping over the sides. Keep cupcakes covered until you're ready to assemble them. 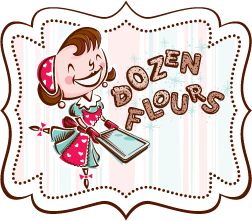 Make these last, as you're assembling the cupcakes because they dry out quickly. Using a the color fondant of your choice, roll out a 3 or 4 inch long rectangle and cut into 1/4 inch strips. Decorate as you feel necessary (I used different frosting tips as stamps to create patterns). Fringe the ends of the scarf. Break several toothpicks in half and remove any splinters from the ends. Stab the bottom of the center of the snowman head and push about 1/4 way in. 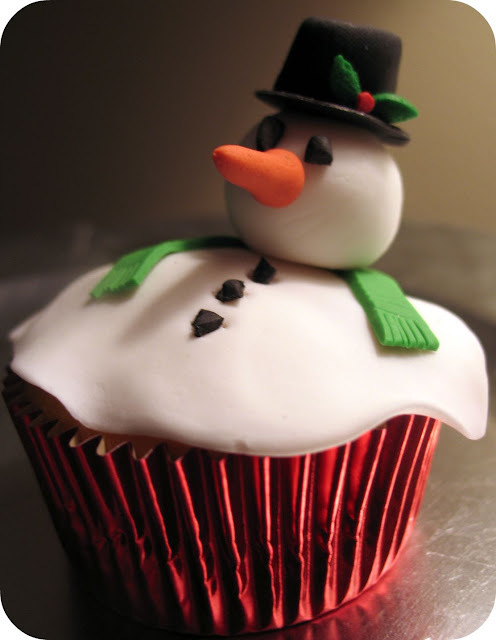 Temporarily place the snowman head onto the top of the cupcake. Aim for a place toward the back of the cupcake surface -- you don't want it dead-center. Using that at as your guide, gently place the scarf (be sure to very slightly moisten the back so it sill stick to the surface) around the spot where the head will go. Position it any way you'd like. 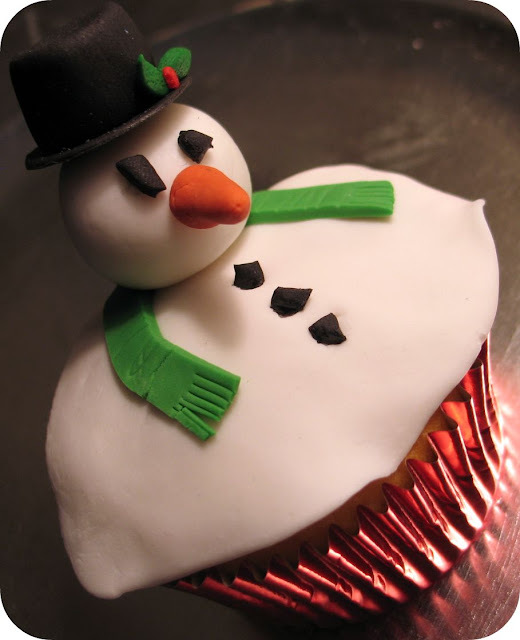 Lightly moisten the bottom of the snowman's head and place it on top of the cupcake. *Sugar glue is CMC powder (also known as Carboxymethyl Cellulose, Tylose, or Tylopur) that you mix with water to create a thick, clear glue. Watch this video on how to make sugar glue. Tee hee!! They are so cute! Now being from Arizona, that's an Arizona snowman...perfectly melted! They are really adorable! I love the hats and scarfs - now that's creative!! Made me laugh seeing them all lined up! Thanks for the mention, Hope you have a super Christmas/holiday! what a cool idea and that cupcake recipe looks fantastic, I will have to gather the ingredients today. These are adorable, I wish I could od that, I would love to try and work with fondant at least once. Have a wonderful Holiday! Those are adorable! They turned out great, too cute for eating! These are absolutely adorable and I can't believe the prep time for the fondant snowman parts! Sheesh. You left no lump of coal unturned in this process. Well done... seriously well done!